Heathkit spare parts are increasingly difficult to obtain now and the SB-Line units were made in the 1960s so some lateral thinking is required to find solutions for broken or worn out parts. 1. The upper unit has been repaired by replacing the broken off lug with a small switch spacer which is held in place using a tapped 10BA brass bolt held in place in a small hole on the main body of the knob using a two pack epoxy adhesive. This is the strongest method of the two. 2. The lower unit: The alternative is to drill a small hole through the broken lug and into the main body. A cut down dress-making pin is then roughened, covered in a two pack epoxy resin and inserted through the lug and into the main body. 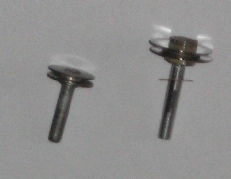 Some additional resin may be required in the hole in the main body. Try and gently clamp the lug in place using a small vice until the resin has set - it helps to align the break as close as possible. Excess resin, once set, may be removed with a sharp modelling knife or miniature file. Avoid getting the resin on your skin. These frequently crack, often due to being over-tightened. I have yet to find a solvent based adhesive that will work with the plastic that was used. One option might be to find a piece of brass tube that is a tight fit over the coupler to use as a strengthening sleeve at each end with a clearance hole in each for the grub screw. The outer diameter of one sample was 0.503inches or 12.776mm. Almost every SB/HW unit that I have seen has O rings that are perished beyond reasonable use. They can be replaced with dial cord and a spring but the O rings are more convenient and are available at a reasonable cost from a Heath spares supplier in the USA. 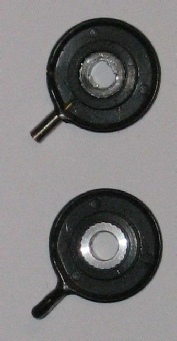 Three O rings are required, two identical smaller ones for the preselector and one larger one for the PA loading control. As near as I can measure they are made of a solid circular material of 0.14 inch diameter and the inner diameters are 2 inches and 2.5 inches respectively. Most of my SB-line units have problems with this part in that they do not grip the clear plastic dial properly. One solution might be to lift the LMO assembly vertically to push the wheel further on to the plastic but this is not easy with the filters obscuring some of the LMO fixings. In the end I decided to make some new adjusters with larger diameter cheeks and this seems to work much better. Ideally the cheeks should be made of thin phosphor bronze or beryllium copper but having none of those I used thin tin plated steel and set the cheek spacing to 0.052inches which is about 0.008inches smaller than the thickness of the plastic. The shaft of diameter 0.123 inches was cut from a retaining bolt from a wafer switch which was exactly the right diameter to fit the dark green front panel moulding and only tapped for a very short distance. The original is on the left and my new one is on the right. 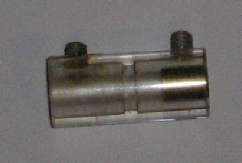 The fixing nuts have been locked with varnish and two washers have been fitted to the front of the shaft to space it off the plastic moulding.